This introductory module to Maqasid al-Shariah (Objectives of Islamic Law) is aimed to promote the need to be conscious on the overarching intent of the Islamic Law. Through appreciation of the concept of maqasid, we will be able to see the relevance of Islamic Law beyond the specificities of a particular ruling. Maqasid al-Shariah allows us to explore the dynamism of Fiqh and ensure that the hukm and fatwa issued in the contemporary times do not diverge from the foundational intent of the Shariah. This module will discuss the origins and history on the concept of Maqasid al-Shariah. It will also discuss the ideas promulgated by various scholars that emphasized the notion of maqasid. This module will also deliberate of the various categories of maqasid and bring into sharp focus the contemporary fatwa as case studies of the modern application of maqasid. For those who wish to understand on objectives of Islamic Law. This class is designed for intermediate level learners and suitable for 18 years and above. 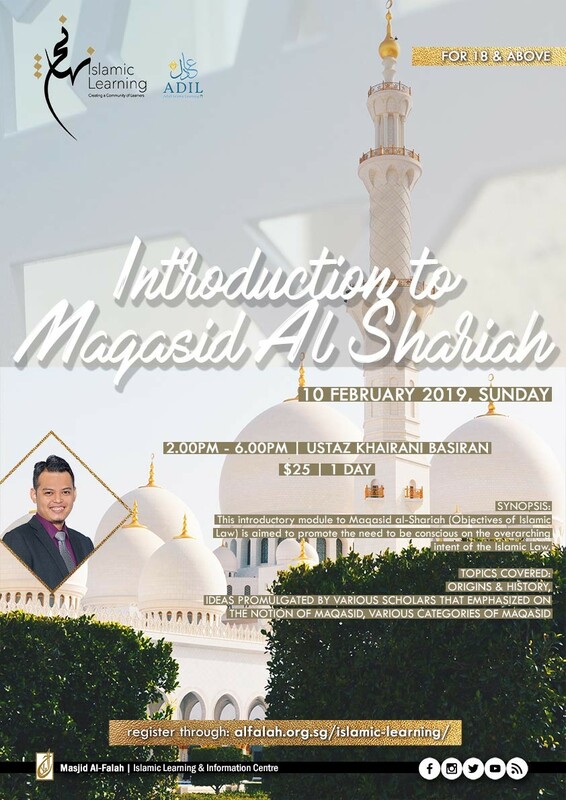 The class will commence on 10 February 2019, Sunday from 2:00pm to 6:00pm and will be conducted by Ustaz Khairani Basiran. The class will be in English. Register now at http://alfalah.org.sg/islamic-learning/ for only $25!